On 20 October hundreds of thousands marched through the streets of London demanding a 'peoples' vote' on Brexit. The motivations of those who marched were varied. Some were marching to show their internationalism and opposition to the 'little Englander' Tory hard Brexiteers, others because of worries about job losses and economic dislocation. The central mobilising factor - which made this far larger than previous similar demonstrations - was the growing fear that the government's negotiations are going to end in a chaotic 'no deal' Brexit. A YouGov poll last week found only 1% of people think the Brexit negotiations are 'going well' and 71% believe they are 'going badly'. No wonder. Despite May's claim that a Brexit deal is '95%' complete, nothing was achieved in last week's negotiations. It is not in the interests of the European capitalist classes for Britain - the second largest economy in the EU - to crash out in a disorderly fashion and it is still likely that May will agree a deal she can at least put to parliament. This would probably be some kind of 'blindfold' Brexit with most of the details still to be negotiated. Nonetheless, the competing interests of the capitalist class of Britain and the 27 EU powers, and the fear of agreeing a deal that could trigger a domino effect across the continent, means that even this is not guaranteed. And if May does get a deal she can put to parliament, it is very uncertain whether it will pass or whether she will survive as prime minister. The only achievement of the last round of negotiations was to further infuriate both wings of the Tory Party by floating the idea of extending the transition period beyond December 2020. The weakness of May's situation was summed up when the Brexit minister, Dominic Raab, agreed that she is clinging to power by a thread but not to worry because its "a pretty strong" one! For the British capitalist class this is an escalating crisis, in which they have no reliable political representation to fight for their interests. A big majority of them would have preferred to remain in the EU, and are now campaigning to stay as close it to as possible. They are desperate to avoid a Corbyn-led government and have hoped May would be able to achieve a form of Brexit they could live with where Britain continued effectively as part of the single market, including accepting all of its neo-liberal, pro-privatisation, anti-working-class rules. However, their hopes of achieving this are being badly undermined by the Tory Brexiteers - with their utopian dreams of a return to Britain's past as a major world power - which they want to try and achieve via a further 'race to the bottom' in wages and working conditions. The frenzy against May by the Tory Brexiteer MPs is increasing, with declarations that she is entering "the killing zone" and should "bring her own noose" to the meeting of the Tory backbench 1922 committee on 24 October. Rumours of the Brexiteer MPs triggering a no-confidence vote in the prime minister have been swirling for months but are now gaining in volume. It is also possible that another tranche of Tory cabinet members could resign, further weakening May. No wonder millions of people are turning away in disgust from the sight of the government tearing itself apart over its varying versions of Brexit - none of which will be in the interests of the working class. Nor is it any surprise that a significant section of the population are prepared to march to demand that the Brexit negotiations are taken out of the hands of the Tories and that the people should get to vote again. There was no clarity from the organisers, however, about what a 'peoples' vote' should consist of. Some wanted a 'yes or no' referendum on any deal May negotiates, but others wanted an option to choose to remain in the EU. Socialists are not opposed to referenda in principle, including a second vote on an issue in some circumstances. Ultimately our attitude depends on whether holding one would help to increase the confidence and cohesion of the working-class majority. However, at this stage any vote which included the option to reverse the result of the 2016 referendum would be seen as trying to reverse a democratic decision and a betrayal by many of the millions of working-class people - who voted for Brexit in a revolt against the establishment. The 'peoples' vote' we are fighting for is not a second referendum but a general election. No Brexit negotiated by the Tories will be in the interests of the majority. Corbyn should fight a general election on a manifesto for a socialist Brexit. This would mean negotiating in the interests of the working class. His 'red-lines' would be opposition to all neoliberal pro-capitalist rules. On this basis he could make a call for international solidarity with workers across Europe. Corbyn would, of course, need to seek a trade deal with the EU, but he would be in a far stronger position than May to achieve this on the basis of having won a clear election victory on bold, socialist policies - which would electrify workers across Europe. In addition, a Corbyn-led government would be able to use a programme of nationalisation to take the ability to inflict job losses, closures or reductions in pay and conditions, out of the hands of any corporations that move to take that path. 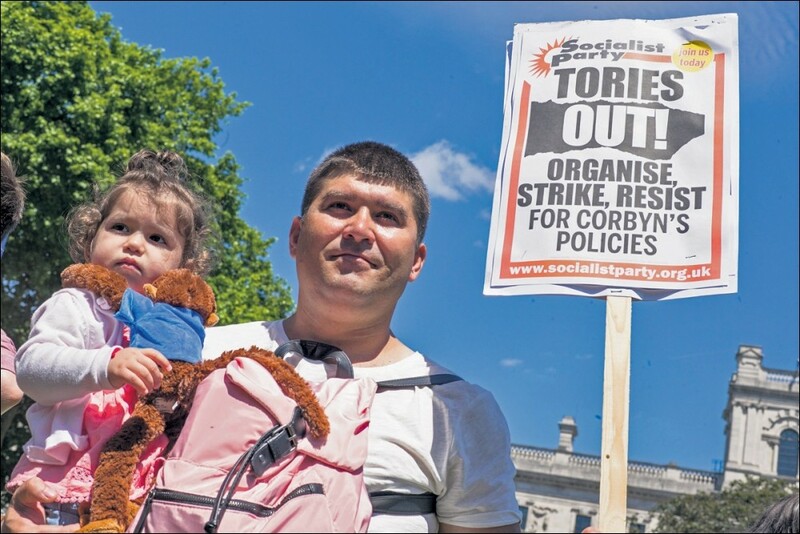 While many participants in last Saturday's 'peoples' vote' march were open to this approach, for the capitalist politicians who headed it, a Corbyn-led government with socialist policies is a nightmare scenario. Representatives of the pro-EU wing of the Tory party marched alongside pro-capitalist, pro-EU Blairite politicians and the leaders of the Liberal Democrats. This was summed up by the pictures of Tory Anna Soubry and Blairite Chuka Umunna with their arms round each other. All of them see their role as defending the interests of British capitalism. This includes fighting to remain part of - or at least aligned to - the EU single market with its neoliberal rules, but above all by doing all in their power to prevent a Corbyn-led government coming to power and, if it does, to prevent it introducing radical policies in the interests of the working class. Despite mobilising a big crowd by calling for a peoples' vote, it is still entirely possible that some of these representatives of the elite - including those currently in the Labour Party - could end up voting for a deal proposed by May, if they judge she has made sufficient moves towards a 'soft' Brexit, and if they think that is necessary to prevent a real 'peoples' vote' - a general election. In outline the leaders of the 20 October march are the forces that could, in the future, make a new so-called 'centre' party - that is, a party that more accurately represents the interests of the capitalist class in Britain. The turnout will have given them a certain confidence. However, they still face real difficulties. The mobilisation on 20 October was based on the fear of a Tory Brexit, but that does not mean support for the pro-privatisation, pro-war, neoliberal policies which are all these capitalist politicians have to offer. The fundamental reason for the crisis of the major political parties in Britain is the crisis of capitalism which offers the working and middle class a diet of endless low pay, insecure housing and overwork. For Jeremy Corbyn and the Labour left it is well overdue that attempts to seek unity with the pro-capitalist wing of the Labour Party cease. Democratising the Labour Party, including urgently introducing mandatory reselection, is vital to ensure that - if a snap election is called - Corbyn is not fighting the election surrounded by Blairite MPs who are openly plotting to prevent him being elected or, if he is, being able to act in the interests of the working-class majority, including fighting for a socialist Brexit. Can you donate to the Socialism 2018 appeal? 1821 Cinderloo uprising: "The crowd thought it had nothing else to lose"